We all know that shoes are fashionable women's favorite accessory. It has became so common that it’s our obsession that no one longer feels bad about buying another pair of killer heels or soft, delicate slippers. But let’s face it, it`s not only a made up, consumptionist phrase – shoes do have a big meaning, since they shape a whole silhouette and are a perfect way of self-expression. There is no doubt that walking through the crowd wearing a perfect pair of shoes gives us a certain amount of confidence. Charlotte Dellal, the designer behind Charlotte Olympia brand seems to fully understand that fact. Halfh-english, half-brazilian, daughter of an ex-model Andrea Dellal, and sister of famous London it-girl, Alice Dellal is one of the most gorgeous women within the business. She graduated from Cordwainers, the prestigious college that also produced Jimmy Choo, and opened a London flagship store last July. You can see follow her blog and see a bit of her fabulous personal style here. If you feel a bit bored with market crammed with luxury brands like Manolo Blahnik and Christian Louboutin you should definitely take a look at her label. Charlotte Olympia`s always feminine and classic designs are full of colors and amazing small details that give them humoristic twist. Those small touches as well as incredibly high heels or platforms make them stand out of the crowd. Charlotte is constantly in-love with the by-gone era, 1940`s and 50`s and you can really feel that nostalgic retro vibe in her designs. A/W 2011 collection is called “To Die For” and it`s inspiration ware the queen`s of crime, Agata Christie`s novels. There is a shoe called Arleneafter Dellal’s favorite book character from “Evil U nder the Sun”. The collections is made of beautiful velvets, vivid colors and leopard prints, and again all the lavish details make it very individual and remarkable. 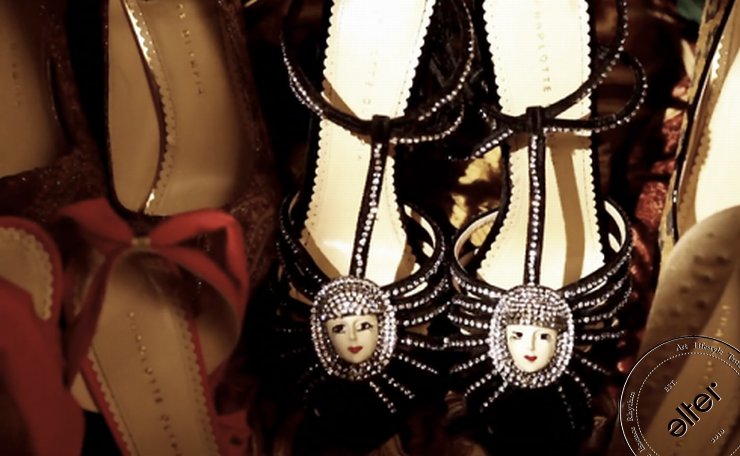 Every piece is followed by a gold spider web, which is Charlotte Olympia trademark. There is a short noir-inspired film presenting Charlotte Olympia Fall 2011 collection that you can see on style.com. We highly recommend!